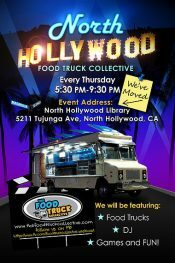 The North Hollywood Food Truck Collective is a weekly event featuring rows of food trucks cooking up a variety of tasty fare — like lobster rolls, banh mi sandwiches and churros. As you hop from truck to truck sampling different types of cuisine, enjoy a mini-street fair filled with games, live music and more. For more information, click here.